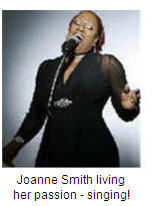 For her first segment of Pursuing Their Passion, Donna interviewed jazz singer extraordinaire, Joanne Smith. They talked about Joanne's love for singing and how she is not letting family responsibilities keep her from pursuing that passion. This interview will inspire and motivate you to find and follow your passion, regardless of what you think is standing in your way. Here's the recording of Donna's interview with Joanne Smith.. Created by Donna "Serious Satchell", Pursuing Their Passion is a series, in various formats, featuring stories and live interviews with people who truly love what they do. These individuals may be pursuing their passion on their jobs; as full-time or part-time entrepreneurs; in roles for professional, social, or faith-based organizations; as volunteers in their communities; as favorite hobbies or as personal endeavors. Some of these individuals are being extremely well paid for their work while others are receiving limited monetary compensation and still others none at all. However, they are all reaping the rich rewards of self-fulfillment and the tremendous sense of personal achievement from what they love doing. And those around them are benefiting from their efforts and their work. Through Pursuing Their Passion, you will be able to read remarkable stories and to hear exciting live interviews* in the form of tele-sessions and webinars. Be prepared to be inspired to find your passion, or possibly even a new one. *CD's and podcasts of the live interviews will be available so you can listen to them any time you need to be inspired.